The Adley Furniture Collection features a Sofa and Club Chair. 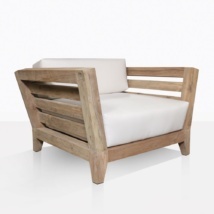 These pieces are made with thick, solid reclaimed teak and topped with plush Sunbrella® cushions. The pieces are sold separately so that you can get exactly what you want, maybe that includes two or three club chairs and one sofa; you can choose what will fit your space! The design of the Adley Collection is absolutely stunning. The pieces are grand and solid with impressive weight. Even though they are large and made with thick wood, they have a beautiful elegance that is soft and romantic. It has the perfect balance of style that will suite many spaces. 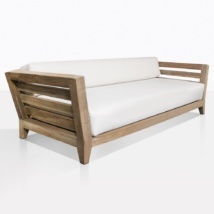 Add a contemporary touch with modern ottomans, or stay with the rustic vibe and add reclaimed teak coffee tables. Shop today online, or call us! We look forward to assisting you.